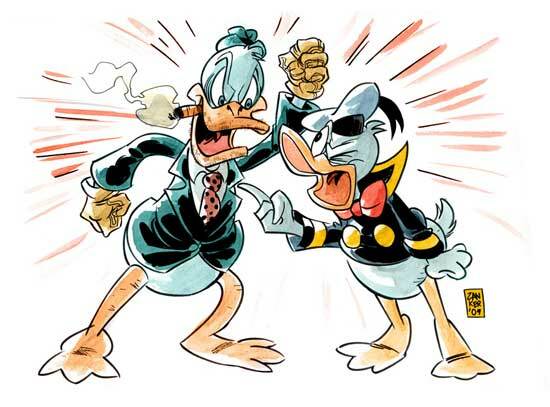 This week we discuss who would win the battle of toughest waterfowl–Howard the Duck vs. Donald Duck. These two have been feuding on and off over the years; there was even a lawsuit between their respective parent companies Marvel and Disney. So what would happen if these two pants-less ducks did battle? Neither one has a size or physical advantage over the other. Howard is known for chain-smoking cigars, so that may have some stamina issues. Over the years, we’ve learned that Donald Duck is pretty lazy so I would assume he isn’t in the best physical shape. So do either duck have any fighting abilities? Howard is the master of the martial arts fighting style known as Quack-Fu. Donald doesn’t have any formal fighting skills, although I would assume that he did learn some combat skills over the years. He did serve in the navy during the DuckTales cartoon series. That said, Howard would have the fighting advantage. But who would I put my money on? This entry was posted in Uncategorized and tagged disney, donald duck, friday fights, howard the duck, marvel by Chris. Bookmark the permalink.